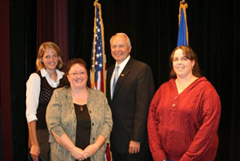 Congressman John Kline honored IRIS Volunteers with Congressional Certificates of Special Recognition at the "Star of the North" ceremony Wednesday September 12th at the Lakeville Area Arts Center in Lakeville, MN. The three IRIS Volunteers who were honored were Jessie Donahue of Morristown, and Elizabeth Schmit of Veseli. Both women have been active in Infants Remembered In Silence, Inc. (IRIS) following the death of their children (Kilian Donahue and Zachary Schmit). Donahue and Schmit were recognized for their dedication to IRIS and their volunteer efforts for the non-profit. Both Donahue and Schmit have been active in efforts to raise funds for IRIS and have assisted at many IRIS events including the annual Balloon Release, Holiday Service of Remembrance, Support Group meetings, and have both volunteered in the IRIS office. 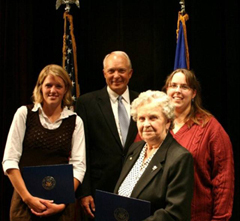 Anna Kincade of Faribault was recognized for knitting and crocheting infant burial blankets / afghans for IRIS as well for assisting and teaching others who also knit and crochet for the organization. "The Star of the North was born out of a desire to pay tribute to those people in our district who reach out to others," Kline said. "These simple acts of volunteerism are the bedrock of our communities and we see countless examples of this every day."